Traveling in India we where told that even when we left India; India would never leave us. Now I am convinced that is true. Some times I find myself longing back to the bazars, smells and all these kind and helpful peoples we met. Some of them I more helpful than others. During our visit to MacLeod we posted some parcels the 24 of June. It was a days work to get them ready and have them posted, but what does it matter in India? 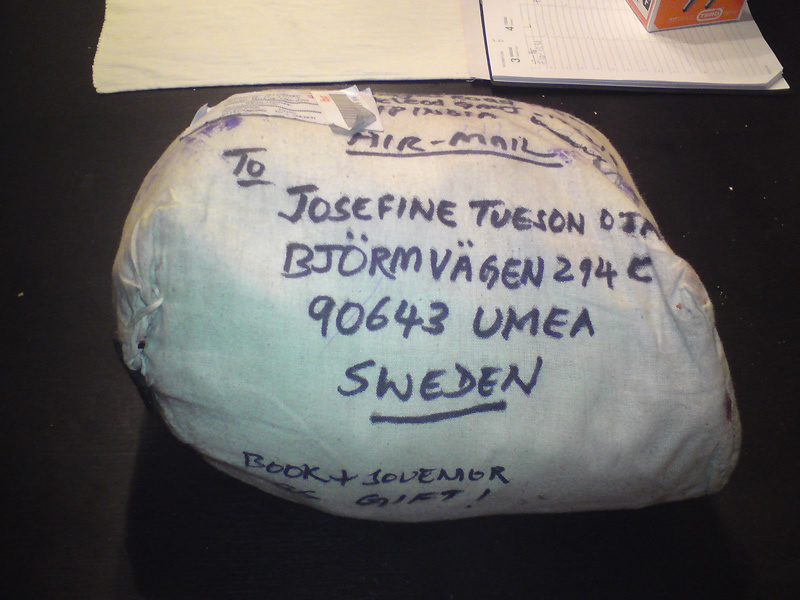 All parcels got to Sweden before we came back except one to my daughter in Umeå. It vanished and I thought it was gone for good. I remembered the first time we went to the post office we where asked to write a from address so we went back the day after with the adress to Green Hotel written on the parcels. The parcel weight was 1200g and airfreight is 763Rs so some weeks later i wrote a letter to Wangdue and posted it with some printed photos and rupees enough to cover airfreight, expenses and inconvenience he might have when posting this parcel again. I did not hear from Wangdue and I thought the letter never found it’s way to MacLeod an Hotel Green but during my visit to India I learned the most basic rule; endurance. Today the parcel arrived to Umeå, my daughter, son in law and my granddaughters finally got their gifts’, hopefully with some fragrance of India. Wangdue, I will always be grateful to you. I bow deep and hope you and your family will have a prosperous and happy life.